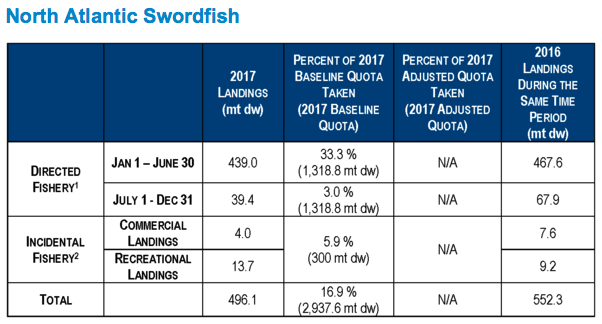 The table below provides preliminary landings estimates and remaining quotas as of July 31, 2017, for the Atlantic swordfish fisheries for the 2017 fishing year. We estimate landings using commercial dealer reports and reports by anglers in the HMS Non-Tournament Recreational Swordfish and Billfish Landings Database and the Recreational Billfish Survey. Please note that these estimates are subject to late reporting and do not include discards. Totals are reported in metric tons (mt) dressed weight (dw); 1 mt is equal to 2,204.6 pounds. The 2017 annual directed landings quota seen below has not been adjusted for 2016 underharvests and does not include the reserve category allocation or international quota transfers. NMFS is currently working on adjusting the 2017 baseline quotas for these factors based on recommendations from the International Commission for the Conservation of Atlantic Tunas (ICCAT). Annual directed quota split equally into two 6 month seasons (baseline: 1,318.8 mt dw per season); contains landings reported by vessels with a directed swordfish limited access permit, handgear swordfish limited access permit, swordfish general commercial permit, HMS commercial Caribbean small boat permit, or HMS charter/headboat permit (when on a non for-hire trip). Recreational landings (HMS angling permit or HMS charter/headboat permit when on a for-hire trip) and commercial landings by incidental swordfish limited access and incidental HMS squid trawl permit holders count toward the annual incidental quota. This notice is a courtesy to Atlantic swordfish fishery interests to keep you informed about the fishery. Official notice of federal fishery actions is made through filing such notice with the Office of the Federal Register.